A hardcover printed comics collection, covering the foibles and frustrations of 16-bit Sonic the Hedgehog games one act at a time. 355 backers pledged $17,778 to help bring this project to life. UPDATE #8: DID SOMEONE SAY BLUE PAGE EDGES?? UPDATE #7: A BONUS $15,000 STRETCHGOAL! UPDATE #4: FRAMED STRIP PHOTO! UPDATE #3: HARDCOVERS FOR ALL! UPDATE #2: WE GOT PRESS! UPDATE #1: MET THE GOAL! ALREADY! So we made one. With a clever Sonic reference for a name. And we’re posting it online, one act at a time, for each of the classic 16-bit games. You can read it right now, for free! So far, it’s been a labour of love. Our day jobs paid for the material, web hosting and other bits of work required. And after an intense month of writing and drawing last year, the series is complete. The final strip (Doomsday Zone) is scheduled to be posted on the site on the last day of 2013. But there is one last thing we’d love to do before we put the project to rest, and we’re gonna need your help. The “Not Enough Rings” art style was kind of accidental. Veronica decided on brightly-colored Copic markers to emulate the distinctive fantasy worlds which make up the “Zones”. The rough-textured Bristol board used to soak up the ink naturally followed. Nothing huge — just a lovely little keepsake to remind us of the games we grew up with and the time we spent memorialising them. We’re hopeful that with the support of a few likeminded people, we can make it happen! All the stages are complete and will be book exclusives! Whoa! We wanted to capture the spirit of our little parody comic in a shirt. So we went for the obvious subject: the Carnival Night barrel. Even if you figured out the mysteries of the D-pad back in the day, wear it to make your friends feel bad! We will screen print on high-quality American Apparel shirts in a variety of sizes, for men and women! Copic markers look amazing in real life. There’s a vibrance to them that’s impossible to replicate on-screen! You just have to see the originals. We’ve sourced some custom-made timber shadow box frames painted with the same blue color we used for Sonic: PANTONE 2925 C.
Basically every strip is available! If you’re quick, you can likely pick your favorite stage! We’re going to offer some advance copies of Upstage, the Bittersweet Candy Bowl card game. We’ve been collaborating with people for about a year to make this happen, and now that it’s ready we thought it’d be a nice extra to include for the BCB readers out there! In Upstage, players set the scene and tell a story. Each player draws a “script” and takes turns to change up the central “scene” to match the story elements their script requires — 2 characters, a day and a place. You’ll need to blend your skill, creativity and deceptive ability to succeed! Upstage is suitable for 2–6 players, requires no prior knowledge of the BCB comic, and features 94 cards and a ton of unique artwork, in-jokes and references. It’s simple enough for your family and friends, features deep strategic elements and is a lot of fun to play! We have combined the rewards in different bundles. Take your pick! We’ve been quoted $6,500 to print “Not Enough Rings” as a perfect-bound matte softcover. That’s what our basic goal covers, and we’re sure it’ll look great! BUT: it would cost $10,500 to change our order to a cloth-bound* hardcover with nicer paper and a custom Sonic-logo-ribbon bookmark ribbon. (*Or cloth-like material.) That “book upgrade” is our single stretchgoal, it would go out to all of our backers and it’d be just plain AWESOME. We hope we can make it there. We know that old-school Segasonic fans are hard to come by these days, but we have had wonderful feedback from readers and we think it’s all worth a shot to finish this project properly by getting it into print. Come help us make a lovely object! Not Enough Rings will be our fourth printing project. We know how to do this, and we don’t foresee any problems printing and shipping a high-quality book to everyone. However: delays happen. For one of our last books, we were let down by a specific printer and missed our estimated delivery date by a few months. There’s a chance that could happen again. However: this time we’re sticking with a tried and true printer who has a record of delivering on-time, and we’ve made sure to finish the book in advance. All it’s gonna take is the funding and we should be able to ship all these items within three months of project end! NOT ENOUGH RINGS, THE BOOK: A full-color collection of the whole series. All books include the bonus Competition strips and a PDF download! TIME OVER T-SHIRT: A tribute to the most terrifying obstacle ever to find its way into a Sonic game, printed on a quality unisex American Apparel shirt. We’ll ask for your size later. BOOK & UPSTAGE BUNDLE: Get an advance copy of our new Bittersweet Candy Bowl card game, “Upstage”, alongside a lovely new Not Enough Rings book! BOOK & SHIRT BUNDLE: They go so well together! SIGNED BOOK & SHIRT BUNDLE: A book signed by the two of us, with a quick Segasonic drawing inside from Veronica! Plus the shirt. SIGNED BOOK, SHIRT & UPSTAGE BUNDLE: The book, signed by us with a Segasonic drawing inside (we’ll ask for your request later! ), the shirt and an advance copy of the BCB card game! I WANT IT ALL BUNDLE: A framed, signed original strip, the “Time Over” T-shirt, card game, and — of course — a signed book with a Segasonic drawing! What a deal! 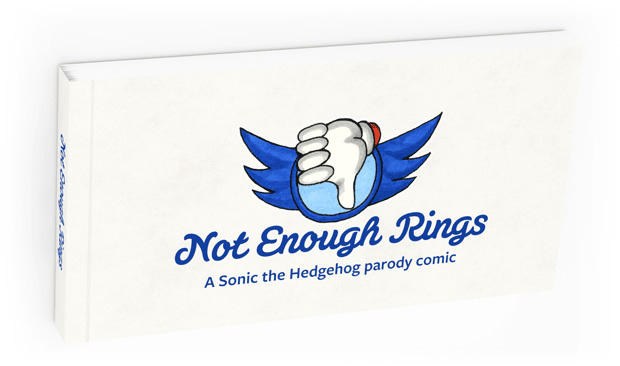 CAN’T TAKE NO FOR AN ANSWER BUNDLE: We will write and draw a “Not Enough Rings”-style strip for a Sonic stage of YOUR CHOICE, from ANY SONIC GAME. Any one. Then we'll frame it and send it to you. Plus you get a signed book, card game and shirt!